Do you want to have a better game and performance? Try wearing one of these 10 best arm compression sleeves that don’t just protect your arms from the harmful heat of the sun but are designed to improve your blood circulation, reduce your muscle pain and comfortably keep your arm cool, fresh and dry that can definitely bring you at the top of your game! #1. McDavid Compression Arm Sleeve, 50+ UV Skin Protection, Cooling Arm Sleeve for Sports, Running, Basketball, Baseball, Football, etc. This surprisingly great product includes two sleeves which make your arm muscles stay warm and active with the compression technology feature. They also protect your skin from abrasions as they are also featured with hDc Moisture Management Technology aside from the 6-thread flat-lock technology that improves strength at the seam. With this cute arm sleeves, you can coordinate and fashion your outfits with your own athletic style. Hence, with this great product, you’ll be able to aquire all benefits such as comfort, improved health and performance with great look and confidence. With RoryTory’s Cooling Arm Elbow Compression Sleeve Arm Guard, you will be able experience high performance, support, and comfort as these sleeves can gently relieve all muscle pressure and muscle tension from intense sports and fitness activities. These amazing sleeves cover and protect your arms from the sun’s harmful ultra-violet A and B rays and can help prevent different skin deseases as well as help reduce muscle cramps and soreness, age spots, wrinkles, sunburns, lymphedema, skin damage and many more benefits. These compression sleeves are durable and they serve as cooling or warming sleeves which allow your arms, elbows and hands the ability to function normally and breath with proper air flow. This product also helps cool the skin surface quickly due to its quick-dry and moisture-wicking material and you are safely protected from the sun. Available in a variety of different styles and sizes for women, men and children. Made of 8% spandex and 92% tactel materials. Elixir Arm Cooler is the perfect accessory for summer training, racing and many sports and fitness activities that reduces damaging muscle vibrations and reduces muscle soreness. Also, this great product makes you feel cool in hot weather when you do summer activities and also when you are driving as it helps to protect your skin and feel cooler because of its special moisture-radiating material that offers cooling effect. Zensah Compression Arm Sleeves are ideal for any sport and fitness activities. They will help keep your blood flow smoothly to your muscles, feeling you warm that can your performance up to the maximum level. This great product is one of the most comfortable compression arm sleeves around due to its second-skin feel that can really give you a cool feeling. ergonomic fit that increases blood circulation to enhance your performance. These sleeves are also moisture-wicking and thermal-regulating that keep the arms cool and they are perfect for crossfit, basketball, baseball, golf, tennis, martial arts, softball, running, and any fitness and sports activities indoors and outdoors. Compression helps to prevent injury and improve muscle recovery as well as increasing blood flow and reducing muscle soreness. They are both solar and cooling arm sleeve – the silver ions in the fabric provides both UPF 50+ sun protection and thermal regulation to keep arms cool. It has moisture-wicking and anti-odor fabric that keep you smell fresh and dry throughout your workout. ensure they withstand the toughest workouts. their shape or elasticity due to innovative fabric. are tag-free to prevent discomfort and chafing. This innovative product, MISSION X Wade Collection is the evolution of performance wear which has been designed in collaboration with Dwyane Wade, a pro basketball champion and NBA all-star. These compression cooling arm sleeves are the fusion of MISSION innovation and Wade’s unique style and it is limited-edition. The MISSION x Wade Collection delivers the ultimate high-tech performance and high-end style which features particles that rapidly attract and remove sweat that are embedded permanently at the fiber level and designed to never wash out. This compression product gives you the 4-way stretch that enables you for a full ranged motion and a secure locked-in feel. Designed in collaboration with NBA basketball all-star, Dwyane Wade. You can step up your game and have a better performance with these compression sleeves which has an enhancing design and accesories. These compression sleeves features lightweight compressive fibers which are flexible enabling every user for a full range of motion and provide an enhanced breathability that keeps your skin wet-free. This product also features 15-20mmHg graduated medi compression to increase circulation and with a 3D anatomical design that gives a comfortable and wrinkle-free fit aside from the special padding that protects the elbow, reduces the pain and risk of injury in the arm. Provides the forearm, bicep, elbow and wrist with comfortable performance compression. The compressive fibers fit every arm like a second-skin keeping the sleeves in place. Padded cushioning on the elbow ensures comfort and support. No worries for sunburn when you put these sleeves on as they can protect your arm from UV, dust and wind while your are having outdoor activities especially during summer. This product has a unique design that provides you the best comfortable touching and experience due to its high elasticity and no binding feeling and you can put this into your refrigerator for a more effective use. This great product is suitable for men, women and can be worn by a fat or thin who wants to reduce and avoid arm pain or elbow soreness and swelling. Designed to protect muscles and promotes faster recovery and blood circulation. These great compression sleeves are designed to make your performance better as these promote oxygen supply to arm muscles, reduce lactic acid accumulation and increase blood circulation aside from its capability to reduce muscle vibration, reduce fatigue and prevent cramps. SHINYMOD Arm Sleeves are made to last longer due to its high-elastic compression fabric that carefully sewed with high-quality articulated seaming to prevent riping off. The anti-slip band keeps the sleeve in place and comfortable that enhances your focus on whatever activities you do such as golfing, cycling, fishing, driving, jogging, claiming, boating, gardening, basketball, tennis and so on. This product also has a special fabric that makes it more breathable that can warm your arm and can make your skin fresh all day long. #9: Beauty7 Arm Compression Sleeve UV Protection – Cycling, Running, Sports, Tattoo Cover, etc. 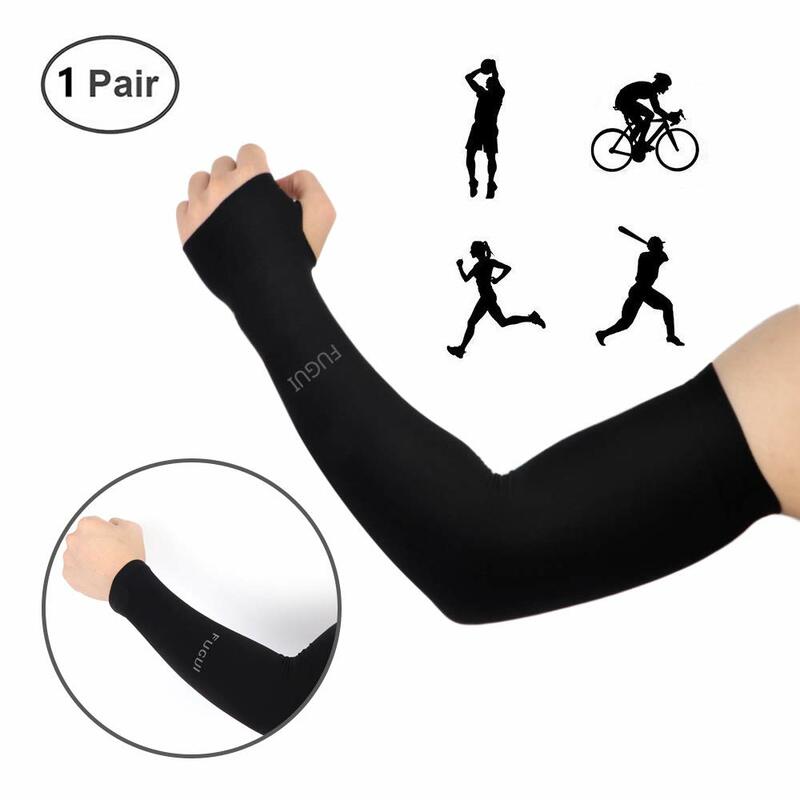 These full arm cover are made from high quality polyester and spandex that make them super elastic and comfortable for sports training, cycling, running, jogging, golf, fishing, hiking, gym workout and many more fitness and sports activities. These compression sleeves are designed with super moisture absorbent, breathable and comfortable fabric that can adjust the levels of harmful bacteria, regulate temperature, release and neutralize the smell of sweat. This kind of compression fabric also provides faster muscle recovery and blood circulation that makes this product one of the best options. Can adjust levels of harmful bacteria and neutralize the smell of sweat. These arm sleeves provide stability and sturdiness to your arms with a comfortable fit that protects your elbow and arm against hard impact. They are made of elastic weft-knitted high quality fabric that is durable, breathable and help the sweat to evaporate quickly that make them perfect for tennis, volleyball,softball, basketball, baseball, running, weightlifting, cycling and many more indoor and outdoor fitness and sports. Everyone wants to always give the best for every performance but your body particularly your arms are not at all times 100% to be at their best – it is here when you need most these amazing sleeves to make your game even better! Thus, wearing one of these when you’re at your best, your performance surely steps up to be the greatest! Enjoy and be safe always!